In New York, UNICEF set up a vending machine so that New Yorkers could buy filthy water for $1. This innovation is UNICEF"s effort to shock the public into awareness of the problems and dangers a child must face when they do not have clean water to drink. Mission accomplished. UNICEF's innovative idea to place bottled dirty water into a vending machine and sell it to the public has "engaged over7.500 pedestrians, attracted worldwide media coverage, and increased the number of donation beyond all expectations/ the wide media exposure continues generating online and text message donations to UNICEF" (Hooked On Ads). Imagine this impact this project would have if UNICEF expanded the project to every city in the United States. This dirty water isn't just any old dirty water either. 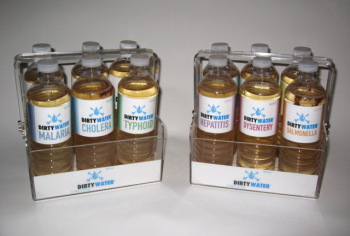 Each bottle of dirty water comes with a "disease". There appears to be 8 varieties of disease to choose from: malaria, cholera, typhoid, dengue, hepatitis, dysentery, salmonella, and yellow fever. The choice is up to the buyer. Any one of these bottled diseases can be purchased for $1. Each $1 goes towards UNICEF's program to help provide clean water to children. Donations can also be made by texting TAP to 864233 (UNICEF) or by visiting tapproject.org. Every dollar donation will provide a child with 40 days of clean drinking water. To make this project possible UNICEF had a $0 budget. This is obviously not a lot of money to work with (nothing) so UNICEF had to be creative and quick with ideas to really help people understand the problem children with only dirty water to drink must face every day. Take a look at this video about the dirty water project and how people in New York reacted to vending machine. To find out more about UNICEF or the dirty water project visit UNICEF's dirty water website. HuffPost Social News + Facebook = Strange Bedfellows? The Stats On Social Media Today Will Astound You! Drink A Zima, Kiss A Celebrity! This is the most stupid and idiotic idea i have ever heard of. Offering dirty water full of disease is most certainly not going to help the cause. I hope they don't actually contain the disease or i shall file a law suit against unicef. You really think they'd put diseased water out into the public? I think this is a great idea. It's raising money and awareness. Way to go UNICEF. Why drinking dirty water if you can conserve clean water by using some filter.